Eric Lloyd Wright , Frank Lloyd Wright’s grandson was also Anaïs Nin’s brother in law. Rupert Pole’s mother married his father Lloyd Wright after his parents divorce. Rupert’s half brother, Eric Lloyd Wright designed Nin’s “House of Light” in Silver Lake. Thanks to Suzanne Graeber for sending on this information. Apologies for the slap dash cut and paste of this post. We thought it more important to get the information out since the show will be up for just a week. 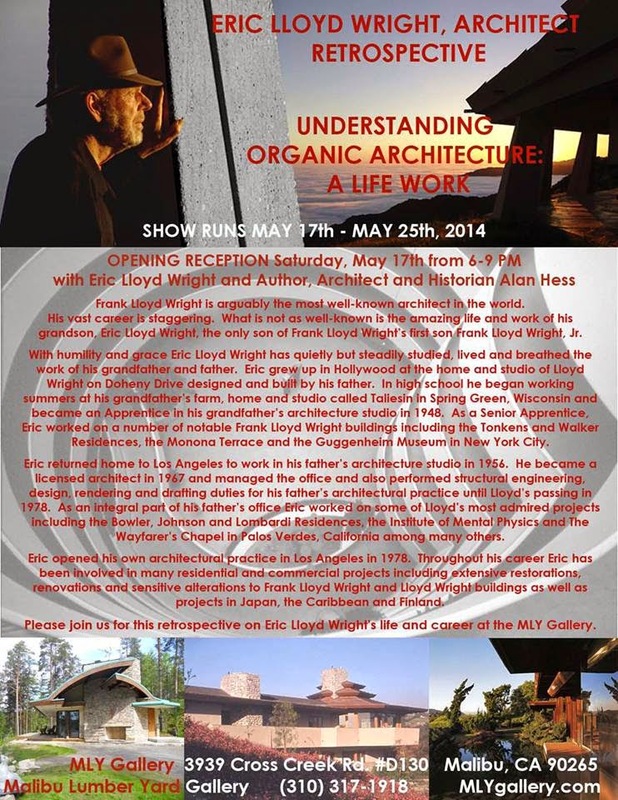 Eric Lloyd Wright is an American architect and the grandson of the famed Frank Lloyd Wright. Wright was born in Los Angeles on November 9, 1929 to Helen Taggart and Lloyd Wright(Frank Lloyd Wright Jr.), a landscape architect and architect who was the eldest son of Frank Lloyd Wright Sr. Educated at the University of California, Los Angeles, Eric worked in his grandfather’s (1948-1956) and father’s (1956-1978) firm as an apprentice before establishing his own firm, Eric Lloyd Wright Architects and Planners, in 1978.